I don’t know about you, mama, but I severely underestimated how much work having a baby would be. Yes, yes, yes, every single one of my friends who were parents before me spoke about the challenges and how little time you have but I thought, “Surely they must be exaggerating!” They weren’t. So here comes my little dude and I am overwhelmed with how much laundry, diapers, appointments, crying fits, and giggles there were. Then add on all the things I had to do for myself, like run a business, and you know, shower, and exercise slowly moved to the bottom of the list of priorities. But the thing is, I also severely underestimated how much I would miss working out. It was such a big part of my identity (and what I do for a living) that I had to find creative ways to get a quick and effective workout. You know what makes an amazing exercise tool? Your little one. 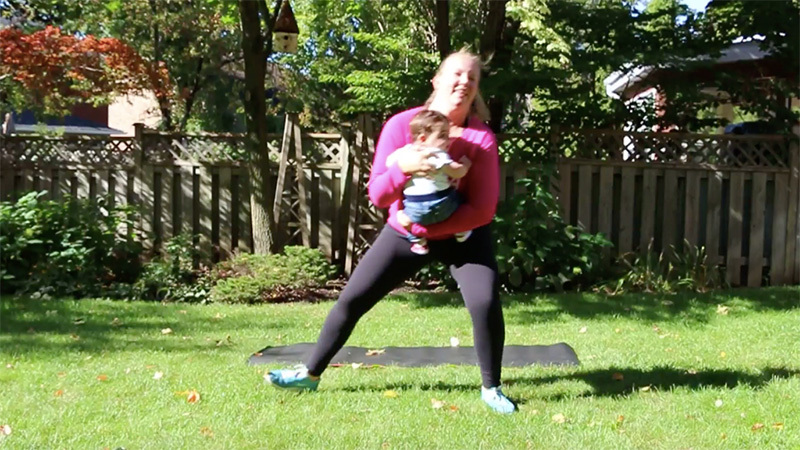 Here are four exercises that you can do with your baby that will give you a full-body workout. Do 10 repetitions of each of these exercises, and complete the circuit three times. Lying down on your back, with your feet resting close to your bum, sit your baby on your hips. Thrust your hips up to the sky while exhaling and pulling your belly button into your spine and your diaphragm up under your rib cage, while squeezing your bum. Make sure you are putting the pressure in your heels and not your toes to activate your glutes and hamstrings. Slowly lower to the ground and repeat. That’s one rep. If your little one can support their neck, you will hold them under their armpits. Drop into a deep squat and when you come to standing, exhale, pulling your belly button into your spine and lifting your little one over your head. Make sure to keep your shoulders over your hips instead of leaning back. Hold your little one nice and tight to your body. Drop into a squat position and shuffle your feet (heel first) to the side four times while keep your bum nice and low. Side shuffle back. Keep up a good pace to get your heart rate up. Hold your little under your armpits and out from your body. The further out your hold them, the harder this exercise will be. You are going to bend your knees a little bit, keep your shoulders over your hips, hips over ankles. Turn your shoulders to the right, exhaling all of your breath, and count to four. Inhale, returning to centre and count to four. Exhale and turn to the left and count to four. Inhale returning to centre and count to four. Do 10 repetitions of each of these exercises, three times through and voila! A full-body workout while entertaining your little one. Remember mama, it matters: everything we do, every example we set, they are always watching. This is why it is awesome to workout with your Littles. They see it and they internalize it. They watch you take care of yourself. They watch see how you make yourself a priority. And they follow your lead. Well done Mamas. Well done.